Continuing with co-hosting duties of 25 Days of Christmas with Star from over at Stars Pink World. Today's topic is Christmas Traditions. We always get it the Saturday or Sunday after Thanksgiving and try to have it completely decorated by the Wednesday. Another tradition, we open one Christmas present on Christmas eve. The rest have to wait till Christmas day. And yes, we still get up early to open all our gifts! 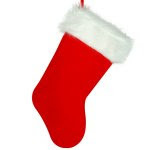 Another thing we still do is leave cookies for Santa and hang our stockings. We go old school and have the traditional red/white stockings. What's your Christmas Traditions? Link up and let us get to know them! Your traditions sound like so much fun! Ours got all turned around when we got married so we're trying to start our own traditions. Yay for Christmas! I have the whole 4 Xmas to go to between the 2 days, so it gets a little crazy but gotta see everyone! Each Xmas has it's own traditions I couldn't miss! 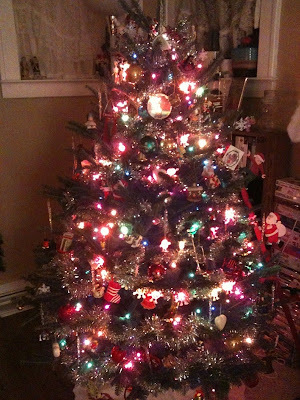 We do a live tree each year. My dad pretends like he hates he hassel, but I know he loves having them too. We open gifts with my family on Christmas Eve too! 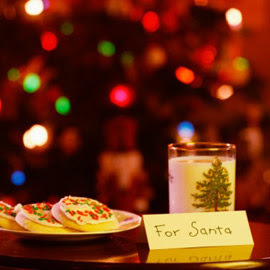 I love that you leave cookies for Santa! I've never done that, not even as a kid. Thanks for co hosting lady! I love hearing other people's traditions! We tried the open one present Christmas Eve for a few years, but it never stuck. My mom always gets me a new pair of Christmas pajamas, which is one of my favorite traditions! I also love Christmas morning pancakes. We always left Christmas cookies too!! And then the next morning "Santa" left us a note on the napkin! ;) Such great memories!! !